For the role of the sassy bartender , Katie, there was no other option but Taylor Pietz! Taylor is a South St. Louis native who started her journey in performing at a young age. Taylor is a classically trained pianist and teaches private piano and voice throughout the St. Louis area. She teaches in the Arts Department at Thomas Jefferson School as well as Leaping Lizards Performing Arts Studio. As a choreographer, she has worked with several companies including KTG, Spotlight Theatre, Whitfield School, and MICDS. Taylor is also an acomplished actress having worked with numerous professional theatre companies in the St. Louis area including New Line Theatre, Insight Theatre Company, The New Jewish Theatre, Dramatic License, and four seasons with Stages St. Louis. Taylor has been seen such shows asOUR TOWN (as Emily Webb) and 1776 (as Martha Jefferson) with Insight Theatre, the American regional premiere of CRY-BABY(as Allison Vernon-Williams), EVITA (as Eva Peron), BLOODY BLOODY ANDREW JACKSON (as Rachel Jackson) and the world premiere of LOVE KILLS (as Caril Ann Fugate) with New Line Theatre, for which she was named Best Actress in a Musical by the River Front Times in 2010. 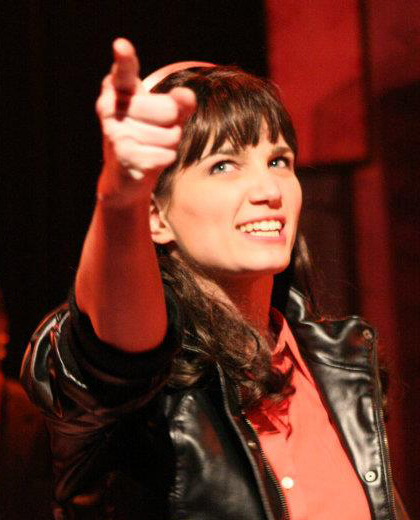 Most recently Taylor received a 2013 Broadway World award for Best Supporting Actress in a Drama for her performance as Emily Webb in OUR TOWN and was nominated for a 2013 St. Louis Theatre Circle Award for the same role. No stranger to film, Taylor has appeared in such films as FIREPROOF GLOVES, GLASS TURNS CLOUDY and HAVE A NICE DAY. Her slate never clear, Taylor will next be seen as Tansy in Larry Shue’s THE NERD with Dramatic License in May as well the American regional premiere of HANDS ON A HARDBODY with New Line Theatre in June.